knives are nice and sharp. I labeled each knife on the block or you can't tell which is which, but I'm pleased with quality so far. Introduce ease and upgraded performance to your meal prep with this impressive 18-piece knife block set from Chicago Cutlery. With full bolsters made of solid high-carbon stainless steel, each knife blade has been sharpened using Taper Grind technology for enhanced edge retention and easier resharpening. These blades are rust and stain resistant to ensure long-lasting use. I own a smaller similar set of Chicago Cutlery knives. This set was purchased as a Christmas gift for my son & daughter-in-law. It is a nice looking set & I know from experience that this isa a quality set of knives. I am pleased with my purchase & I know they will be too. These knives are the best! I love the full-length stainless steel look and feel. They are easy to grip and stay sharp. The only thing is that you have to keep them dry. If you leave them in water or don’t rinse and dry them right after use, they may start to show some rust stains. So make sure to rinse and dry them after each use. Other than that, they’re a great, high quality knife set for everyday use! I would recommend these! Chicago cutlery is the best knife set I have purchased. The block has a sharpener in it too keep all of your knives sharp. The knives are incredibly sharp and there are a variety of knives to get the job done. Chicago cutlery has been around for a long time. American made is a big plus for me. I would highly recommend this product . I had previously purchased a much cheaper knife set from Overstock, to be more economical. It was awful, so I returned for this set. The quality difference was noticeable immediately! This set is much heavier duty, came with a lot more knife options and has a handy sharpener built in. I will only be washing these by hand, to ensure no rusting. I've only had the knives for a few weeks and I love them. The arrived sharp and shiny and I've used them to cut cheese, chicken, pork, fruit, bread, and lots of other things with no problems whatsoever. The knives are well made enough for my use. The sharpener is easy to use, but I can't comment on its effectiveness yet. The bread knife was great on the soft french bread from the grocery store. These knives replaced an old $10 set so they are like going from a scooter to driving a sports car. I'm happy with my purchase. Excellent knife set. Good design and balance, sharp, and excellent selection of pieces. I'm particularly happy with the poultry shears an area that hasn't companies tend to neglect. My last set of Henckels lasted over 15 years. I can see these doing the same. 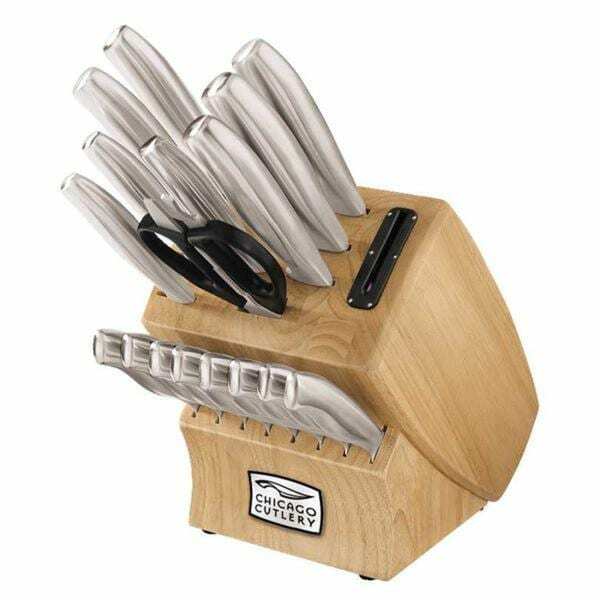 I really wanted a natural color knife block with stainless handled knives. IT HAS BEEN so hard to find that combination! This set is great. Looks great on the nautical counter AND the knives are a great quality. Very Pleased! Years ago I received a carving knife and fork as a gift. I was thrilled when I saw the same brand and style. I could not be more satisfied. I especially like the solid blade and handle, no rivets. They stay sharp but the sharpener in the block is good. They are decent knives but rust very easily and quickly. However they are sturdy and the scissors are as well. This is your basic knife set. Nothing fancy. This set is very nice. The quality is great and it goes will in just about any style of kitchen. Very happy with this purchase and would get it again in a heartbeat. Sharp just like they said. The knives are lighter than I thought but they are still sturdy I haven’t used the sharpener yet because they are new. I don’t put in the dishwasher for fear of rust. These knives are beautiful and very sharp. I am so glad I ordered them. The price may me worry about the quality, but they are excellent! These knives are so lightweight. I love how sharp they are and that the sharpener is built into the block. I bought my mom this set a couple of years ago and they are still just as sharp as when I bought them. Sharpest knives I've ever had. The weight of the blades and perfect. The steak knives cut through like butter. I would recommend these to everyone! I absolutely love this knife set. I even bought another set to give as a gift. The thing I like most is the fact that the knives are not held together with any screws or rivets. Therefore they will never come apart. I highly recommend this set! "What is the total width of the knife block?" "These knives are not serrated are they.....hate serrated knives"
No they are not. The bread Knife is but should be. I simply love these knives btw. I have been VERY pleased with the purchase.